Before you beat the goalie, you must beat the defender! 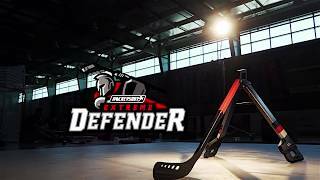 Introducing HockeyShot’s foldable Extreme Defender. Shaped like a pair of skates and the blade of a stick, practice getting around (or through) the competition by showing off your dangles. 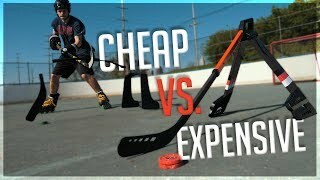 You can even lift the stick to simulate face-offs and takeaways! You can't beat the goalie if you can’t beat the defender in front of them. That’s what HockeyShot’s foldable Elite Defender is for. Shaped like a pair of skates and the blade of a stick, you can practice getting around (or through) your opponent. You can even lift the stick up to simulate face-offs and takeaways! Everything you loved about the Attack Triangle + many more situational drills. Robuste et maniable! Un outil tout à fait génial! My 7 year old loves it. Great for learning to fake and show how to lift a stick. Love the Defender! Quick to set up, quick to take down. Excellent design! High quality product! Perfect for training. The new attack triangles work amazing and great progression from original ones. My son really enjoy the extreme defender for stick handling training. It has only been used off ice but, appears to be good quality. Good product. 7 yr lifted the stick and then broke. Was replaced immediately and had for next practice. Just a great product for my 6 and 12 year old boys. So many different features for drills! Replaced my Attack Triangle. A very fun product to use. I love the creativity you can do to customize your training while having a great time! I recommend this product to everyone. It's good for training . Easy to use/store. Durable but also made of flexible material, so you can easily set them up and maneuver to your liking. Fun! Great for training. Quite realistic.